Enzo offers research kits, biochemicals and biologicals backed by over 40 years of expertise. As Scientists Enabling Scientists™, we realize the value in providing relevant information to our customers working in the fields of life sciences, drug development and clinical research. We are happy to provide simple but useful tips for improving daily tasks as well as the overall quality of your research. What are some tips and tricks to make my IHC staining better? 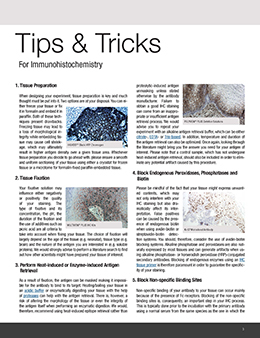 How can Enzo help you improve your IHC workflow? Access the E-book by filling out the form!